The overall confidence in the Modern and Contemporary Photography market increased by 7% in the last 6 months, and currently stands at 75 (a reading above 50 implies that there is more positive market sentiment than negative). 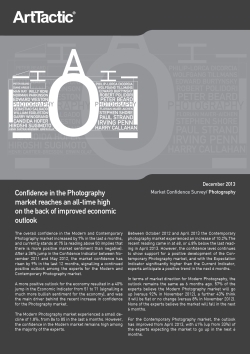 After a 38% jump in the Confidence Indicator between November 2011 and May 2012, the market confidence has risen by 9% in the last 12 months, signalling a continued positive outlook among the experts for the Modern and Contemporary Photography market. A more positive outlook for the economy resulted in a 40% jump in the Economic Indicator from 51 to 71 (signalling a much more bullish sentiment for the economy), and was the main driver behind the recent increase in confidence for the Photography market. – Artist Short- and Long-term Confidence Indicators and Rankings (Moderrn and Contemporary Artists).